Today’s special guest is Malcolm Colley. 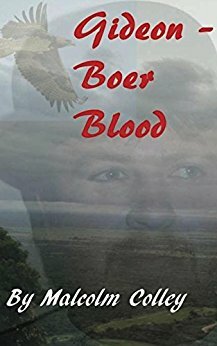 We’re chatting about his new adventure/historical fiction novel, Gideon: The Boer Blood. Malcolm Colley was born in South Africa in 1942 and spent his teens of the 1950’s on a small farm just outside Naboomspruit in the Northern Province of South Africa, during which time he came to love the sounds, smells and sights of the bush. Welcome, Malcom. Please tell us a little bit about your latest release. The eagle perched on the rock right at the top of the kopje and surveyed the horizon. It was the beginning of summer and, even this late in the evening, it was still hot. He was looking east and so had the setting sun at his back. He cocked his head left and right and the back again and ruffled his feathers. The small dust cloud had been moving in his direction for a few hours now. With his excellent vision he could see that it was a man on a horse. The eagle cocked his head sideways. This man was sitting at an angle. The eagle had seen this way of sitting before and knew that this man wasn’t going to reach this kopje before he fell off. He could see the blood. Blood caked the front of his shirt and had pooled and coagulated around his belt. Blood excited him and he watched with interest. He didn’t eat humans nor did he eat dead animals but anything dying interested him. The eagle dropped forward off the rock, dived for a few seconds and then opened his wings to catch the upward current to take him to five thousand feet. Not that he knew that it was five thousand feet but he knew what his ultimate hunting height was. He banked on the thermal and looked down on the rider. The rider was laying forward on the horse now. My next book is the story of a young man who must come to terms with the fact that, if he is to save his marriage he needs to give up the working life that he loves as a mercenary. The story takes place in Africa in the 1980’s. I don’t consider myself a writer but a story teller. I wrote my first book about thirty years ago but never got around to publishing it. It is only since I retired that I have been writing full time. My day is taken up with reading for research, which sometimes turns to reading for pleasure when I suddenly come across something interesting, and then fitting the research into a story. I spent my teens of the 1950’s on a small farm just outside Naboomspruit in the Northern Province of South Africa, during which time I came to love the sounds, smells and sights of the bush. I did my army basic training with 1st Special Service Battalion in Bloemfontein and have happy memories of army life in the bush. I also spent twenty-five years training in the martial arts. During my work in a steel mill and underground in a diamond mine, I always yearned to be back in the bush. Thanks for joining me today, Malcolm.